Widely regarded as the grandfather of British science fiction television. 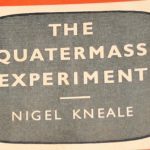 Professor Bernard Quatermass, created by Nigel Kneale in 1953 has featured in five TV series and four feature films. This was the first adventure to feature the Professor and it concerned the return to eath of an experimental British spacecraft which during its mission had been knocked off course into deep space. The final outing (Well apart from the BBC remake of the original story in 2005) for the Professor, this time played by John Mills. Set in the near future, we see a world gone mad, society has broken down, the streets are run amok with marauding gangs. The Professor believes that all of this is in fact caused by some form of alien attack, as large groups of “Planet People” as the young are calling themselves are being killed in mass gatherings by beams of light from space. Produced in two versions, a four part TV drama, running nearly four hours and a cut down 90 minuet version for theatrical release.